Sometimes we must ask ourselves: “How good can it get?” We receive in accordance with what we speak over our lives and you have been amazing thus far! Your positivity, your hard work, your faith, your abundant thoughts, words and deeds are leading to your dreams being fulfilled. It is challenging work yes, but if done in the energy of love, gratitude and fun, it leads to even more success! Know that every little step, every single effort, every spoken word you are creating your beautiful future. Cultivate a love for the beautiful things in life – schedule activities and do things you love this month. You may even want to purchase that beautiful outfit or shoes you love so much! Dear God and Archangel Jeremiel, guide me in this time to review all that I have learned through the eyes and heart of Love. 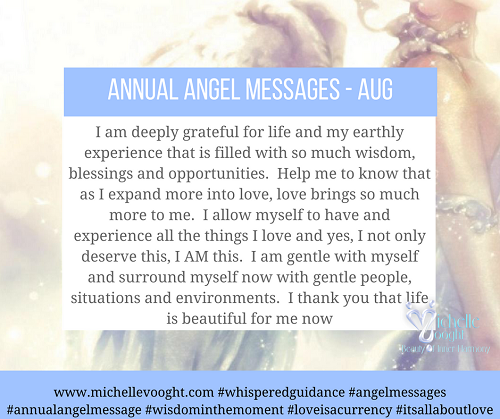 I am deeply grateful for life and my earthly experience that is filled with so much wisdom, blessings and opportunities. Help me to know that as I expand more into love, love brings so much more to me. I allow myself to have and experience all the things I love and yes, I not only deserve this, I AM this. I am gentle with myself and surround myself now with gentle people, situations and environments. I thank you that life is beautiful for me now! And so it is. Amen.